Grant, Peter. "Hells Gate". The Canadian Encyclopedia, 12 January 2017, Historica Canada. https://www.thecanadianencyclopedia.ca/en/article/hells-gate. Accessed 24 April 2019. 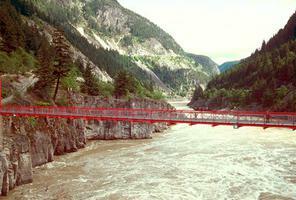 North of Hope, BC, on the Fraser River (Corel Professional Photos). Hells Gate is a narrow rocky gorge of the Fraser River Canyon south of Boston Bar, British Columbia. Explorer Simon Fraser recorded a difficult portage (1808) around the churning waters of this section of the Fraser River. First known as the "great canyon," its name is associated with the disastrous impact of Canadian Northern Railway construction on the river's salmon resources. After blasting debris and rockslides (1913-14) blocked much of the pacific salmon runs, the catch from the river's stocks plummeted. The first fishways were constructed here in 1944 to permit spawning fish to pass the rapids however, stocks have yet to fully recover. Hells Gate now has an aerial tram ride and highway tourist facility.